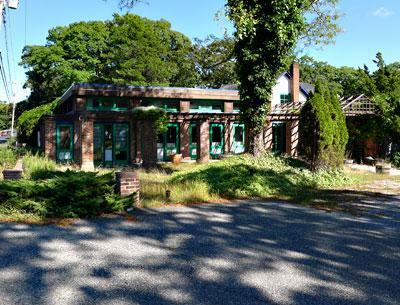 As the owners of the building at 103 Montauk Highway, which most recently housed a restaurant called the Players Club, seek to sell it to a landscaping company, the East Hampton Village Zoning Board of Appeals debated at its meeting Friday whether the restaurant’s pre-existing, nonconforming use had been abandoned. The property has residential zoning, and the restaurant has been defunct for about two years. The prospective buyer, Michael Derrig of Landscape Details, plans to use the building as an office and showroom, and has applied for site plan approval and a permit to allow the conversion of the property to commercial use. He has pledged that no trucks or materials would be kept on the site. Ken Collum, a building inspector and code enforcement officer, told the board that the parcel had been a restaurant or other public-assembly site since the 1920s. Jeff Bragman, an attorney representing the owner, Demar Holdings L.L.C., argued that, while the restaurant operations had ceased, the business operation had continued and therefore the use had not been abandoned. “This would be as close to a conforming use of the zone as you can get without reverting to residential, which is sort of unrealistic if you look at the property — it’s a big commercial building,” said Jon Tarbet, an attorney representing Mr. Derrig. But Frank Pulka, who lives next door, insisted the parcel should revert to residential use. He said the village code defines a restaurant not as a business but as a use, and that the complete cessation of that use was clear. “The discontinuance of nonconforming activity for a specified period constituted an abandonment of use,” he said. Eight surrounding property owners also have submitted letters opposing the application. “If you are to ignore code . . . and disregard the unanimous opinion of eight property owners, you must have a compelling reason. Absent that compelling reason, this application should be denied,” he said. A determination, however, will be delayed. The buyer would like to “land bank” some of the parcel’s required parking spaces, meaning the spaces would be designated on the site plan but that they would actually be created at the building inspector’s discretion. That must be done pursuant to a covenant, Linda Riley, the board’s attorney, told Mr. Tarbet. “The terms of that covenant haven’t been submitted. . . . I’d like the board to see it and review it.” The hearing will resume at the board’s Oct. 10 meeting. The board also announced two decisions. The East Hampton Presbyterian Church was granted a permit to add 11 parking spaces and to partially realign its driveway. It also got permission for the continued maintenance of four air-conditioning units along the rear wall of the church. Michael and Sandra McManus were granted variances to increase the floor area of their house on Fithian Lane from 3,530 to 3,883 square feet, where the maximum permitted by the code is 2,895 square feet. They plan to construct a bedroom on the first floor.